The SFMTA has released a draft list of the 68 street segments it’s looking to include in the next wave of improvements to the city’s bicycle network [PDF]. 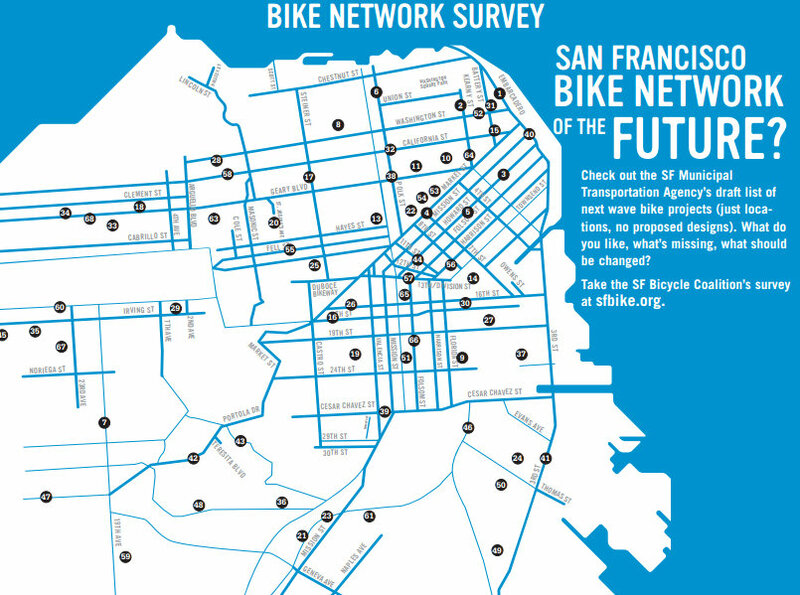 The SF Bicycle Coalition mapped out the list and is asking its members to weigh in on a survey about which streets should take top priority. The SFMTA’s list ranks 150 miles of street segments with the highest demand, according to bike counts and focus groups. Tim Papandreou, the agency’s director of strategic planning and policy, said planners are also targeting hot spots that see frequent bicycle crashes. Under the “Strategic Plan Scenario” of the SFMTA’s Bicycle Strategy — the middle ground of the three scenarios — the agency plans to “enhance” 50 miles of the existing bicycle network and add 12 new miles by 2018. The 150 miles in the current list will be narrowed down to those final 62 miles. At an SFMTA Board of Directors meeting last week, Papandreou noted that the agency already has solid evidence of the increases in bicycling induced by improvements along the “Bay to Beach” route. There are now about 3,000 bike trips on the Wiggle every day in both directions, he said, following upgrades along the route from lower Market Street, to Fell and Oak Streets, to John F. Kennedy Drive in Golden Gate Park. Still, as the SFBC wrote in a blog post yesterday, “This list is just a lot of digital ink until the SFMTA gets serious about funding biking in its April budget vote.” As we reported last week, the agency is banking on three ballot measures this November to partially fund its Bicycle Strategy, and no other significant boosts are proposed yet in the SFMTA’s next two-year budget. Check out the SFMTA’s full list of bikeway candidates in this PDF, and be sure to fill out the SFBC survey here. As cyclists are about 4% of mode share in the city, we should get 4% of SFMTA funding. Right now we’re getting less than 1%. Getting only our fair share would be a HUGE boost, much less the 8% the SFBC proposes. The SFBC map isn’t terribly accurate to the SFMTA proposal. There’s nothing proposed on Castro, for example. I don’t quite understand the Shotwell proposal. Folsom is one block over and Valencia is 3 blocks over. Crossings are going to be hard. What’s the appeal? I like the density of proposed routes in SoMa, which is likely where near-term job and residential growth is likely to happen. And I like the extension of more bike routes into the Richmond, which, with the caveat of a few hills, could be a useful bike feeder into downtown and SoMa. Not sure of the density of the proposal into the Mission, but maybe that’s just a feeling that many recent Mission folks are commuting down the peninsula, rather than needing to go elsewhere, and I could be off base there. A lot of the rest of the city seems rather sparsely served by this, though. This is exactly how _not_ to get things done. We have a laundry list of, what, 17 significant projects? And, as @bingwu:disqus points out, we only have 25% of the funding really required to make any of this a reality. What that says to me is that we need to concentrate _all_ our efforts and resources on the top 5 priorities and consider the rest of the list as what we need to garner funding and support for next year. And while none of the top 5 are in my neighborhood specifically and will therefore not necessarily benefit me personally, I know that we as a walking/biking/living community will benefit immensely if those top 5 projects are done now and done right. Once the high-visibility models are in place, the rest will follow. Can SoMa trade off that one block of Fremont Street for the final 8 or so blocks of Folsom from 4th to the Embarcadero?? If not, perhaps we trade off that one block of Fremont a Street for Beale Street from a Market to Bryant? It’s a relatively calm street once you get past Howard street. Brannan from Divisadero to Townsend ? I’d really love to see the Fell lane continue to Stanyan. All sorts of good about that. It would be great to include the stretch of Folsom from Fourth to the Embarcadero, and would seem to be critical to connect to the major Second Street bike route at the very least. I’m sure that Tim and his crew have a compelling explanation for leaving this out (Warrior’s Arena, Bay Bridge Goat Rodeo, etc). I’d love to see an “SFMTA Question Line” where they would clarify issues that seem weird but probably have rational, if depressing, explanations. I was wondering about that. You can’t actually follow Castro (nor Sanchez) all the way to 30th — the street ends at the top of the hill. Some sort of zig-zagging is required. I feel like Church is a good place to explore bike lanes since it’s wider than average. Similarly, I’ve never understood why people bike down 16th when there’s a dedicated lane on 17th. 16th is frightening to navigate in a car, let alone a bike. I long for the day when one can go from stay on Cesar Chavez from the Mission to the Dog Patch, i..e, going under the 101. I’m not sure how they would do it when traveling from West to East, and btw going from East to West is quite dangerous. Shotwell is a very pleasant and popular neighborhood street to bike on. It is quiet, there are many blocks with plantings, trees and homes, and it carries far less car traffic than either Valencia or Folsom, meaning less pollution and stress for bicyclists than on the larger thoroughfares. It could be made more bike and pedestrian friendly simply by eliminating cut-through traffic (approx 80% of the cars that currently drive on the street) by closing it off every third block or so to non-emergency vehicles. This would not cost much and it would improve the quality of life for everyone living on and traveling down this street except drivers looking to avoid traffic on South Van Ness and Folsom. Really weird that no one has caught that mistake and it keeps getting re-printed everywhere. And since there doesn’t seem to be a legible master map anywhere, I can only guess they mean…Division to Embarcadero? ???? Yeah, there are definitely other (what should be) other major projects left out here. Maybe they have a dedicated source of funding, or maybe they’re just pies in the sky sitting on a shelf (most likely). San Jose Ave? Mansell Ave in McLaren Park? For the 28 route, Pacific and Jackson might be better choices than Washington west of Polk – and from there you could take Laguna down to Fort Mason. On the 2 route between Van Ness and Baker, Green would be better than Union Street, no buses or double parking. The stretches of Washington/Jackson over Nob Hill are cable car-grade inclines – good luck with that. Or San Jose Ave or Mansell St in McLaren Park? Sorry to repeat myself, but talk about bang for your buck–these projects would open up entire neighborhoods to cyclists. The only route that extends from Divisadero to Townsend is Duboce/13th/Division, but I doubt that’s what they meant, especially since 13th is listed separately. Mansell is already in the works, and northbound San Jose is about to get a road diet/buffered bike lane. That is strange, my apologies for not catching that. Columbus and Embarcadero please! But 13th Street west of Folsom doesn’t make much sense, especially if it ends at Mission rather than Valencia (although west of Mission 13th becomes Duboce anyway). Crossing over the freeway ramps would make even a buffered lane scary. I say end it at Folsom, add a left turn signal there, and put in a lane on 15th all the way to Market. I’ve gotta spout off a bit because I doubt there’s any way to do it on the survey: SFMTA, what the hell are you really trying to do here? Do you actually want to increase mode share or just make a few cyclists happier? Did anyone on the Strategy Fact Sheet (the PDF link from SFMTA’s site) else notice that the entire section of the city south of 280 is considered ‘low demand’? There’s a single, obvious, extremely fundamental reason: Crappy connections across 280. In the meantime, this section of the city is where the new housing for families is getting built. Sure, I know SOMA’s getting tons of units too and we need to fix it. But when you’re talking about the hot-button issues of the moment–how to keep the middle class in the city, how to increase transit access for middle (and lower) income foks, how to get kids to school without cars, how to build more housing for tech workers near Caltrain and BART without increasing traffic or the need for more buses, how to beautify and make polluted, blighted areas more economically just–I mean, these are really important issues and they largely concern the Southeast. But right now, the Southern Freeway divides the city and Alemany, San Jose, Mission, Silver Ave, Geneva Ave, 3rd St.–scary traffic sewers cutting through the challenging topography. Then there’s 101 too, of course. And this, my friends, is why huge numbers of kids and lower-income residents do not bike in San Francisco. So this bikeway proposal does have those routes on the project list. But I’m really bristling at this idea that because they get less traffic, they get less priority. The SFBC has a separate ‘Connecting the City’ site and clearly agree this is important, but the site hasn’t been updated in a year and a half. So what I’m clamoring for is more of a push on that angle. I don’t think this current ‘next generation of bikeways’ is at all forward-thinking unless the SFMTA moves the Southeast up the priority list. If you have to get from 16th and Third to, say, 16th and Harrison, it would be annoying to have to cut over one block to 17th and back. Also, I’ve found that the westbound hill on 16th heading up towards Potrero Center is more gradual than the hill on 17th. On a related note, when bike lanes jump a block (in this case from 16th to 17th at Kansas), I wish there were signs at those intersections telling bicyclists where the lane continues. It was a while before I even knew about the stretch of 17th in Potrero. Folsom St from 19th to 24th happened a few months ago with a repaving. I’m curious why the bike lane ends at 24th, leaving a gap between there an the new Cesar Chavez bike lane. I keep saying it because I’m sick of it. I want action, not sayings. “Look twice, be nice” – REALLY? @A A Polk is on there, but #42, so I still remain confused about what they intend to do re translating numbers into actual priorities. 15th is a great road to ride on – not much traffic. Which – 2 lanes in one direction without much traffic? Put in a big honking bike lane! Even with the lane on 17th, 15th is better. The biggest upgrade would be *SOME* way – any way – to make the left off of Division to Harrison a non-life threatening experience. Well said. The southeast compared to the rest of the city has disproportionate access to bike infrastructure compared to the rest of the city (and probably has more car mode share). This is particularly the case on Geneva, and especially on the long block between Moscow and Santos, where one is expected to ride uphill at very slow speeds either adjacent or next to fast-moving traffic. I agree the city needs to spend less time passing resolutions with catchy phrases in lieu of real action, but this posting is about the city’s next round of bike projects, which seems to fit your desire to see action. Another important aspect of improving access in the southern and south eastern neighborhoods is improving links to transit. Though it is uneven, there are some good transit spots that could be better used as hubs by improving access (and this goes for many areas beyond the southeastern neighborhoods). Good bike access and safe parking at Balbao Park BART for example could help improve mobility and lessen car dependence. A similar thing could happen at West Portal, etc. It’s actually 4 dead so far in 2014, 11 including December. The survey lists a Green/Octavia wiggle, but it is not on the map, nor have I seen it described. We need a north end wiggle so you can go from Marina / Cow Hollow to Green and Polk without having to climb half way up Russian Hill or Pacific Heights. How is “Connecting the City” going? Slowly. I see this plan, which is all well and good, but we need action on the ground not more pretty plans.